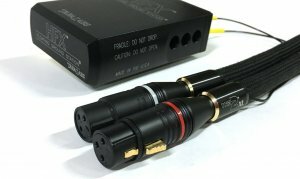 The 2™ XL interconnect cable was created for both tube and digital amplification components. The 2™ XL cables includes our legendary HFX “Floating Ground Station.” The new insulation is modified by the addition of vacuum filled microscopic glass spheres that lower the dielectric absorption. Our patented shielding is then isolated from the termination and integrated into the wire leads. The 2™ XL cable, along with our proprietary SAOF-8N technology (Super-annealed, oxygen-free, frequency-tuned, OHH continuous-cast, 99.999999% pure copper alloy conductor) creates an audio cable that is absolutely fantastic with both tubed and digital components. The cable is extremely detailed and rich in color in the upper registers, a dynamic bass, and is dead quiet with both analog & digital sources. The cable is very life-like in its musicality along with superb sound-staging and imaging.